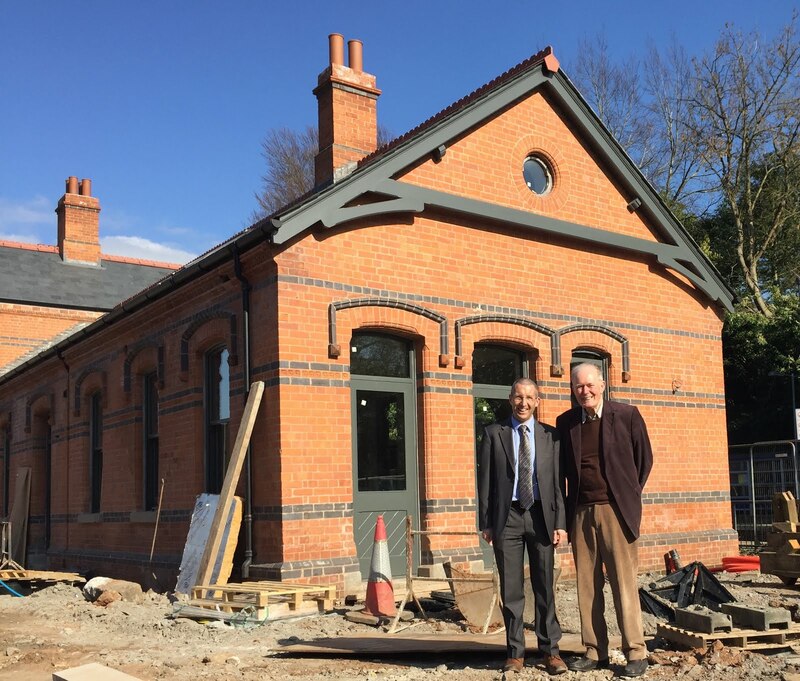 I gained a sneak preview of the refurbishment work underway at old Cultra Station House last Friday 7 April 2017 visiting the building along with retired Alliance Councillor, Conservation Architect and Chair of Holywood Conservation Group Larry Thompson RIBA and am able to report significant progress with refurbishment works timetabled to complete by Summer 2017. After years of relentless lobbying I was delighted to see the building restored to its full glory. Whilst the campaign nearly hit the buffers on a number of occasions, whether due to bureaucratic officialdom from the Planning Service or attitude of the previous owners (Ireland’s bad bank NAMA) both Larry and I kept the project on track and are delighted to see the project come to fruition. Careful restoration work undertaken has helped bring the building back to life with traditional exterior contrasted by impressive interiors to deliver two spacious units within the old Station House sensitively complimented by three additional units within the site. It will be fantastic to see people living in a building previously on the brink of demolition. I am particularly grateful to NI Environment Agency, Holywood Conservation Group, Ulster Architectural Heritage Society, former TD Dominic Hannigan and the many other interested people and groups who helped ensure it was full steam ahead for the Save Cultra Station House campaign. Once complete it will be fantastic testament to fact that hard work and determination delivers. Cultra Station House was built in 1897 assumed to be designed by G.P. Culverwell. The property was built in typical decorative red brick late Victorian fashion. The property consists of a listed building partially two storey and partially single storey positioned to the side of the railway tracks at Cultra. The two storey portion of the property was originally living accommodation for the station master and the single storey portion was the area for waiting, ticket collection and other areas associated with a railway station. Property has been a private dwelling since at least 1937 and in private ownership since 1957, vacated 1970s when it fell into disrepair, vandalised and used for anti-social behaviour. Cultra Railway Station consists of a single storey station building and attached two storey stationmasters house located within a popular and much sought after part of Co. Down close to main arterial routes into Belfast City Centre. The property is listed, however, it is evident that a large number of alterations have been carried out in the past which would likely not have been approved if the property was listed at the time the alterations were carried out namely the removal of the chimney stacks, the replacement of the original roof covering with artificial slates and the fitting of uPVC rainwater goods. The property is in an extremely dilapidated condition with holes to the roof where lead has been stolen, dampness to chimneys due to a lack of lead trays, some movement to external walls, significant dry rot throughout the property, poor plaster, poor ceilings, significant dampness to walls, and dated services. The entire property will require complete gutting should any future use be considered. It is the opinion of the author of this report that given the level of refurbishment necessary to the subject property for any future use following refurbishment it would likely prove more economically viable to demolish and rebuild the property. However due to the listed status of the building this is unlikely to be possible. It is considered essential that the property remain fully secure due to the health and safety risk associated with the property where no balustrading exists, dry rot exists to first floor areas and where much asbestos appears to exist.